In the UK the easiest properties on which to carry out loft conversions are those which have an old style rafter and purlin style roof. Also known as cut timber roofs this roof type are most common in houses built before 1960. This kind of roof is ideal for loft conversions as there is loads of uncluttered space and most will have more than sufficient headroom to allow an easy and fast conversion. The rafters in these kind of roofs are usually made from 4x2 timbers spaced about 15 inches from one another. The top of the rafters are connected to the ridge board and at the other end (the bottom) to the wall plates. There will also be a supporting purlin running across the full length of the rafters. 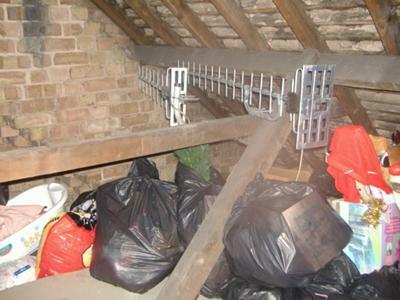 This purlin is normally positioned at around a third of the vertical height of the rafters. In extremely large roofs there is often a second purlin located towards the top of the rafters. A rafter and purlin roof will also have other timbers called hangers and collars. A collar timber is a horizontal beam joining the rafters on opposite sides of the roof whereas a hanger, as the name suggests, hangs down from the apex of the roof to the ceiling joists. The role of both the hangers and collars are to ‘tie’ the roof together and to stop it spreading outwards. The way this style of roof is constructed, with a lack of obstructing timbers, makes them ideal for loft conversions in the UK. Although these roofs are only found in older houses there is a modern version that is becoming more and more popular amongst new home builders. 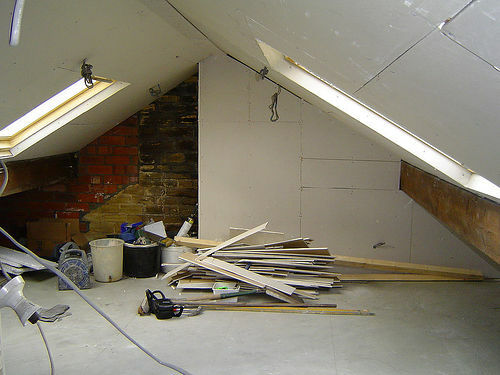 As builders are now more aware of the potential of the roof space to add extra rooms there is a trend to use a technique called RIR (room in roof) which makes loft conversions in the UK more achievable for the homeowner. RIR makes a loft conversion incredibly easy as the roof timbers basically make a shell in the roof with just a couple of vertical and horizontal beams to support the roof. This provides a ready to covert room with plenty of headroom that the homeowner can convert without any hassle or problems.